While a lot of educationalist are talking about flipping the classroom, is MIT working on 'flipping the funnel'. 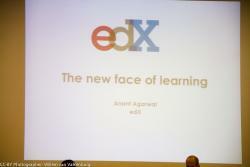 Last friday Anant Agarwal, founder of MITx/edX, did a presentation at the Unesco OER Congress. Traditional most American elite universities have a lot of applications from students to study there. MIT normally has around 18,000 applications and only 1,600 are admitted. Via a proces of selection they go from the 18k to the less then 2k freshman students who will enroll in the courses and almost all of them pass the courses. They call this a funnel (in Dutch: trechter). The information (learning analytics) they have registered from this group is enormous, but also very interesting. MIT will probably use this information in their traditional selection of students. I would be supprised if companies would show interest in this database for recruiting employees, especially because it is an world-wide audience. Offcourse the biggest group was from the US, but the other countries in the top 10 are: India, UK, Colombia, Spain, Pakistan, Canada, Brazil,Greece and Mexico. According to Anant, the real-time feedback was a game changer for this course. He was even talking about green check is a EdX Cult Symbool. For this course Anant had arranged with Elsevier that he could publish the complete book. Elsevier told him a couple of weeks later that the book was completely sold-out world-wide. This is an interesting observation and will certainly mean that Elsevier would like to do this more often. Students get instant feedback on their work. Students can participate in online labs. There is lots of interaction on the discussion boards, also social discussion (about the dog of Anant). If you pass the course you will receive a certificate with your name, the name of the course, your grade. The certificate is issued by EdX/MITx and is signed by the Dean of Online Education. Online students have something in common with residential ones. The do everything just in time. Procrastination! EdX students prefer video's of a professor that handwrites formulas instead of powerpoint. The MIT student watch the lectures at 1.5x speed and read the transcription. In contrast with Coursera and Udacity the EdX-platform will be open-sourced and the content will be available with an open license (CC-license). 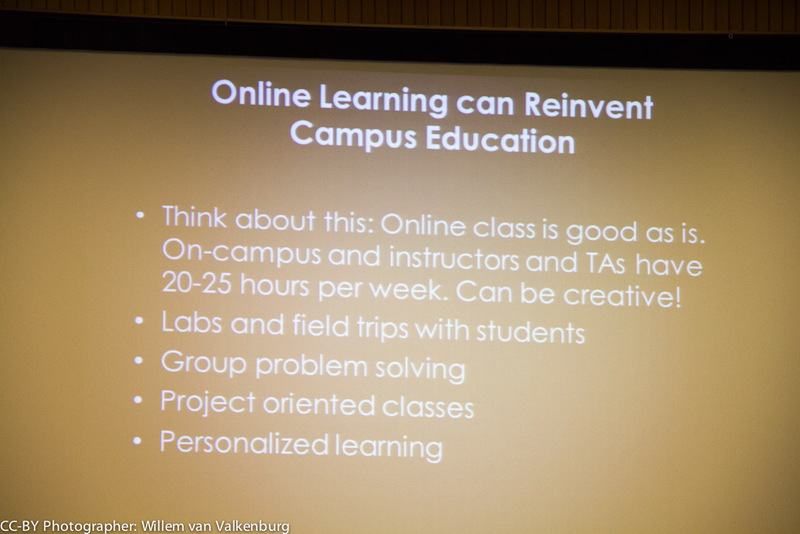 MIT is really making the next step in Open Education. Their ultimate goal is to teach 1 billion student. I especially like the learning analytics and the research they are doing to improve campus education. So also paying students profit from this iniative.